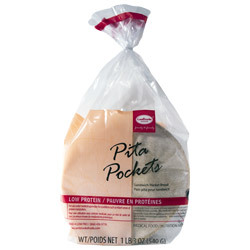 Description: Each package contains 6 low protein pita pockets. Pockets are 6" rounds. Two servings per pocket. Serving Suggestions: Cut across into two halves. Open pocket and fill with your favorite low protein ingredients or salad. To make dipping or snacking "chips" cut round with scissors horizontally to make two rounds, then cut brush olive oil on each side of both rounds, season with your favorite seasoning and bake in preheated oven for about 5 minutes, checking frequently to adjust time for crispness.